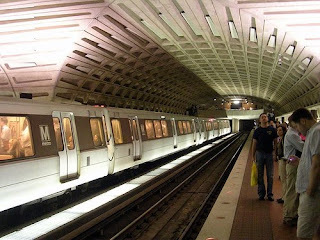 The DC Metro is pretty good. Very clean, reasonably well organized. It also happens to be filled with a lot of very smart people, many of whom are reading cool newspapers or books. This not only makes one feel very smart, but also, allows someone with good eyes, like The Train Cowboy, to read the facing pages and catch up on news. A major negative though is the escalators. Far to many of them are broken far too often. I find myself wondering if they were built by some corrupt contractor who bribed his/her way into the contract and then did a very, very bad job. They seem to take a long time to fix as well. Another negative is the overall lack of coverage. If you live on the Metro, and are going to somewhere else on the metro, you are all set (duh, right?) But if you are going somewhere off the metro, it will be tough to train it alone. The DC buses, unfortunately are not that great. Once you learn them, they can be managed, and the buses running at actual commuting times for a 9 to 5er, tend to show up approximately on time. Timeliness 7 out of ten. The Trains run on time (Mussolini would be proud) but the buses don't always.